When Boston Red Sox take on St. Louis Cardinals in tonight’s potentially-decisive Game Six of the World Series, 12 people will be viewing the action with a uniquely Bermudian flavour. That’s because they’ll be watching from the Dark ‘n Stormy Boardroom, situated perfectly behind home plate at Fenway Park. They may also be sipping Gosling’s products, which are also on sale throughout the stadium, as the Bermuda company makes full use of its status as the official rum of the Red Sox. It’s all part of its drive, which started 10 years ago, to take the island’s popular drink and make inroads into the US market. Huge strides have been made in New England and E. Malcom Gosling, President/CEO at Gosling-Castle Partners, Inc, says being in partnership with the Red Sox has been hugely beneficial. “It’s very exciting for us,” he told the Bermuda Sun. “Part of our deal with the Red Sox allows us to have Point of Sale (POS) and the Red Sox logo supporting our brand throughout New England. The Red Sox endured a tricky year out on the field in 2012 but their comeback and success in reaching the World Series means the Dark ‘n Stormy is getting even more exposure. Gosling’s have attached themselves to a number of big events — the Honda Classic (golf), all five boat shows in Florida abnd the Deutsche Bank Championship (golf) to name a few. Gosling, a lifelong Red Sox fan, admits, though, that there is something special about Boston’s famous ball park. He added: “Part of our strategy is we believe our best sales tool is our product in the bottle so if we can get it into people’s mouths in a creative and unique environment, we jump at those opportunities. We have several going on around the country. “This [Fenway Park] was a way to sample people on the Dark ‘n Stormy – it’s a cocktail that is just so easily transferable from beer. “They loved the whole concept and gave us the opprtunity to brand the room inside and out. 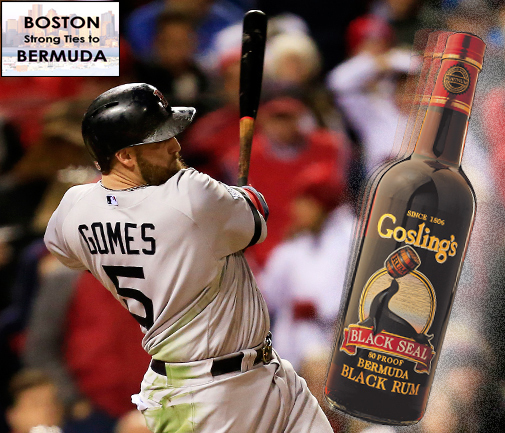 Our online and print coverage of the 2013 World Series, Boston: Strong Ties to Bermuda, is sponsored by Gosling’s. Was Red Sox win a missed opportunity for Tourism?